Is this the year when coach Mike Brey gets his Notre Dame team to the second weekend of the NCAA tournament. Its something that hasn’t happened for Notre Dame in quite some time, but it looks like Brey finally has the squad to do. Notre Dame has always been a great jump-shooting team, but now it looks like they have the total package. 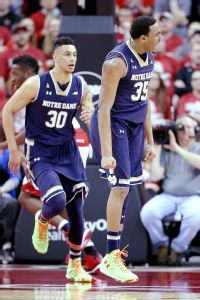 What’s separating the Irish this year is the late season emergence of freshman Bonzie Colson. Colson, with his long arms give the Irish a legitimate post presence. Notre Dame looks right for a deep run this year. If they can show some toughness this March, they could be a sleeper in the tournament. MID-EASTERN ATHLETIC: The MEAC is one of the few leagues that saw a team roll through the regular season undefeated. North Carolina Central looks like the class of a MEAC that is as good as its been in recent memory. Norfolk St and UMES will challenge the Eagles, but expect Central to repeat as champions and return to the NCAA tournament. MID-AMERICAN: As usual, the MAC was competitive like always with three teams, Central Michigan, Kent St and Buffalo, finishing tied for the regular season crown at 12-6. Behind those three, Bowling Green and Toledo finished tied for fourth with identical 11-7 records. Suffice it to say, this thing is completely up in the air. In the end, Kent St’s history navigating this tournament makes them the pick here. SOUTHWESTERN ATHLETIC: Texas Southern, a team that has wins at Michigan St and Kansas St, rolled nearly wire-to-wire here. They have only two conference losses and look primed to make another run to the NCAA tournament. The only teams close, Southern and Alabama St, are ineligible for the postseason but are somehow allowed to compete anyway. Look for the Texas Southern to go dancing.